A movie like this has been a long time coming. After two decades of CGI, most of it subpar, dominating effects in horror flicks, The Void comes along and shows that latex, and other dangerously flammable stuff, still has a place in horror. 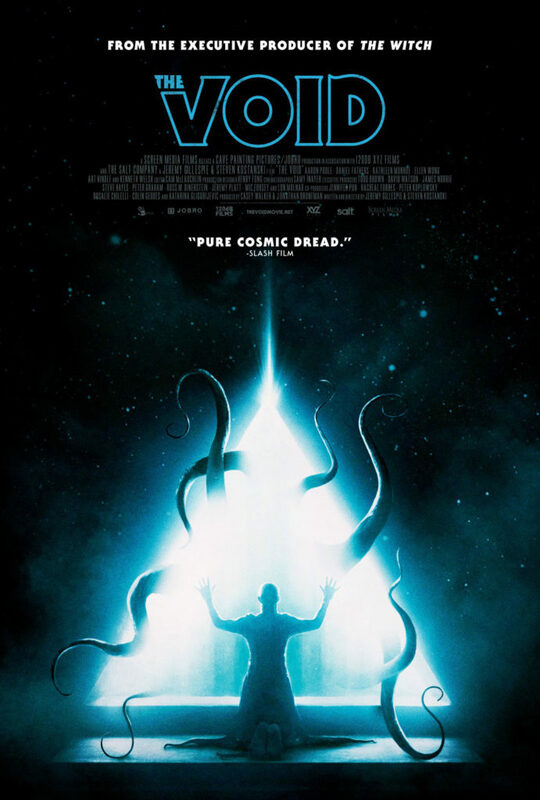 The Void, from writing/directing duo Steven Kostanski and Jeremy Gillespie, has, without a doubt, the goriest creature effects I’ve seen in years. It’s not sickening in the same way of a Hostel or Saw flick, but the creatures in this film are still stomach churning. They exist in that mutant sweet spot between being both human and demon — twisted and bloody messes ripped right out of our nightmares. It’s every bit as disgusting and fascinating as Rob Bottin and Stan Winston’s work in The Thing. Kostanksi was the person behind the creature effects, and he has every reason to be proud of the work he and his team produced. And the amazing thing is, this flick was an Indiegogo project. It raised its effects budget on the crowdfunding site. Between having practical effects and begging on the internet, this doesn’t seem like a film that was destined to be any good. The Void follows a group of people during the worst night of their lives. Somewhere in rural Canada (I think), around 1990 (I think), a Sheriff’s deputy named Daniel (Aaron Poole) comes across an injured man, James (Evan Stern), emerging from the woods. Daniel takes him to the nearest emergency room, which also happens to be at a hospital on its last night of operations after being damaged in a fire. There is only one doctor on duty, Richard Powell (Kenneth Welsh); a pair of nurses, Allison and Beverly (Kathleen Munroe and Stephanie Belding); and bratty nursing intern Kim (Ellen Wong). A patient like James isn’t much of a burden to them, honestly, but James isn’t their most pressing problem. It seems James is part of some satanic cult. The folks in the hospital find this out when robed cult members wielding some wicked knives surround the hospital, attacking anyone who ventures outside. The cultists are a menacing group, faceless and anonymous. All that’s clear about them is that they are a violent bunch. By this time the population in the hospital has expanded somewhat, adding some more fodder for all the bad things that are about to happen. For while the cultists are outside, inside some supernatural force is creating monsters. These bloody, disgusting messes poke, prod, and dismember the cast one by one. They are attacked with axes and guns and whatever else is at hand. Blood and guts and muck splatter all over the place in a phantasmagoria of gut wrenching violence. It’s a beautiful symphony. It’s also an engaging story. This is a gross-out movie with purpose. Its visuals serve to enhance the plot — not serve as the sole selling point for the movie. We viewers are treated to high horror spectacle while also being taken to a frightening place. The plot carries characters and audience along with it, and it does get a little jumbled in the final act. But it’s not like the poor folks who want to survive the night are fully aware of what is happening in the hospital. Evil things are afoot, and they don’t care if it all makes sense to their victims. It’s enough to know that something very bad is around. To go into any greater detail regarding the plot would be to rob too much of the experience from potential viewers, so I won’t do that. Just know that, once or twice a year, a horror film comes out that is miles ahead of its contemporaries. The Void is one of those films.